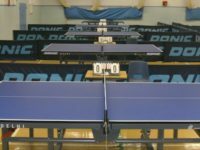 On Sunday 24th March Waterside Table Tennis Club host the final round of matches in this year’s National Cadet League. The three Waterside Teams are spread across the divisions being contested. Currently the A team sit mid-table in Division 1 with Joe Watkins sitting top of the averages on 100%. In the previous round Henry Rogers was the only other player for the A team as Will Agombar was unavailable through illness, with his return they will be hoping to finish strongly. In Division 2 the B Team lead the pack with Jared Hon undefeated and ably supported by Adam Alexander and Alfie Hills. In the 3rd Division our C team have dominated proceedings so far with Katie Le Peuple undefeated on 100% and Lily Mall 90%, Thomas Agombar 80%. Our teams have performed admirably so far, now they must enjoy themselves on the final day and play to the best of their ability. Win or lose they have been a credit to the club and we wish them well.